Oh well. So much of this world is beyond me. 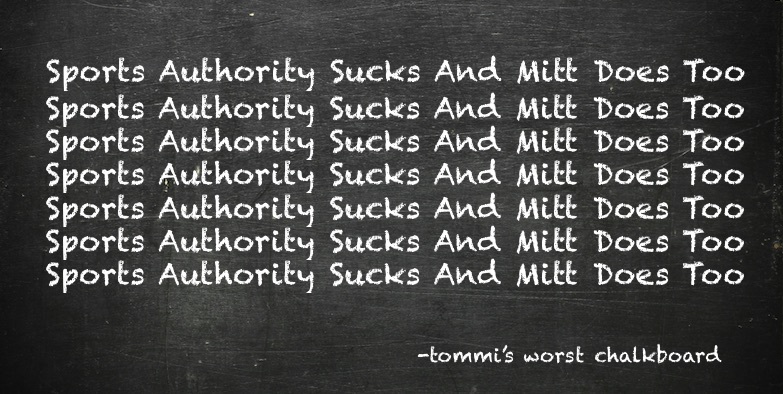 Then again, #american’t almost voted for Mitt Romney a few years back. Anyone remember Mitt? Anyone know why Mitt appears in yet another worstwriter blog post along side a really krappy retailer that deserves to go out of business? Well, now that one of the worst retailers in history is going bankrupt, perhaps a bit of history about where this company came from is due. Or maybe not. Simply put, Sports Authority is a product of the likes of Bain & Company. Bain is Mitt Romney’s shell company where he was able to rob american’t of so much of its resources via M&A deals galore stemming out of the 1980s. Mitt’s great contribution to #Americant, in turn, was that M&A bull$hit turned into private equity über-bull$hit. For you see, dear worst-reader, this is how the smart-asses from Wall Street really screw you. Seriously. They don’t screw you by providing you with loans that you are too stupid to realise you’ll never be able to pay back. Nor do they screw you by being bailed-out because, well, there were millions more suckers than anyone could dream of who were willing to take loans that they didnt know they wouldn’t be able to pay back. Indeed. The likes of Mitt/Bain/private-equity screw you buy taking advantage the corporate needy and the corporate desperate–and let’s not forget the children of capitalist pigs who have now, pretty much, inherited everything post ww2 if not the ill-fated DotCom boom. Inheritance, btw, is the true culprit of the Dubya Bush tax cuts that have bankrupted the country. But on that issue I digress and wish all the suckers out there: good luck–you haven’t earned it.